Perhaps you know how to thwart oxidation when preparing potatoes and serving sliced apples (and if not, we’ll get to that in a minute) but here is a less-common food that often falls victim to oxidation: pesto. Has this happened to you? You gather an armload of picture-perfect basil, blend it together with olive oil, pine nuts, garlic and cheese and produce a fantastic pesto sauce for your spaghetti. Fresh from the blender, it’s as green as your holiday tree. But by the time you serve it an hour later, it’s a dull shade of olive brown and has lost much of its taste. Oxidation strikes again. Combine the basil, garlic and nuts in a food processor or blender and pulse until coarsely chopped. Add 1/2 cup of the oil and process until fully incorporated and smooth. Season with salt and pepper. If you’re eating it right away, add all the remaining oil and pulse until smooth. Transfer the pesto to a large serving bowl and mix in the cheese. Yum! If you’re freezing it (up to three months), transfer to an air-tight container and drizzle remaining oil over the top. Thaw and stir in cheese. You can also stop oxidation by treating fruits and vegetables with ascorbic acid immediately after cutting. 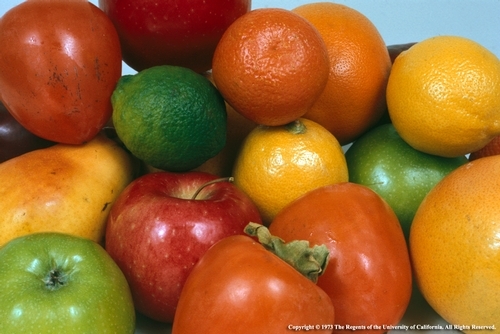 Ascorbic acid is a natural property in many citrus fruits, such as oranges and lemons. Vinegar works, too, but that’s not something you usually want to put on fruit like fresh-cut apples. Instead, squeeze a few drops of lemon or orange juice on the cut side and they’re good to go. One last tip before we both get cooking. Mashed potatoes are a great side dish this time of year, but all that last-minute preparation can be hard to manage. Wouldn’t it be nice if you could peel and cut the potatoes even a day in advance without them turning brown? You can. Place freshly cut potatoes in a bowl, cover with water, squeeze in the juice from two lemons and they will sit happily in your refrigerator for 24 hours. Drain, cook, mash and serve. You can learn more about handling fresh-cut produce at the UC Davis Postharvest Technology Center and explore the joys of plant science at the UC Davis Department of Plant Sciences website. Great topic! Is there anything that growers can do during harvest or post-harvest to decrease oxidization potential once basil reaches its end user (in my case, restaurants)?